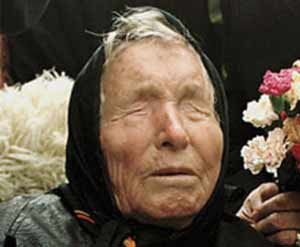 Baba Vanga was a blind mystic, clairvoyant and herbalist who lived in the Kozhuh Mountains of Bulgaria. Her real name was Vangelia Pandeva Gushterov. She was born in Macedonia in 1911 and died in 1996. It is said that many of her prophecies about world events have come true with an accuracy rate of about 80 percent. Because she was a blind and somewhat illiterate woman separated from much of the world, it is possible that she misinterpreted what she was "seeing." Thus her accuracy may have been even better than she was given credit for. Among the most noted predictions were the 9-11 attack on the United States and that America’s Forty-forth President would be black. Vanga gained world attention when she accurately predicted the sinking of the Russian submarine Kursk. In her words: “At the turn of the century, in August of 1999 or 2,000, Kursk will be covered with water and the whole world will be weeping over it.” The nuclear submarine K-141, bearing the name Kursk, sank in the Barents Sea with all hands on August 12, 2000. She made this prediction in 1980, twenty years before the disaster happened. In 1989 Vanga wrote: “Horror, horror! The American brethren will fall after being attacked by the steel birds. The wolves will be howling in a bush and innocent blood will be gushing.” Many see this as a vision of the 9-11 attack on the World Trade Center. She sees workers in the buildings and American soldiers (brethren) literally falling from the towers and on the battlefield after an attack by steel birds, or large jet aircraft. Also interesting is her statement that “wolves will be howling in a bush and innocent blood will be gushing.” President Bush launched an unnecessary war in Afghanistan and then invaded Iraq based upon false information following the attack. Hundreds of thousands of innocent people in both countries died from these attacks and the conflicts continue to this day. Of special interest is the prediction that the Forty-forth U.S. president would be black and that he would be “the last one.” She warned that at the time of his stepping into office the nation would be struck by a terrible economic crisis. There will be conflicts between the north and the south that will escalate and eventually bring the country down. “It probably can divide into the North and South states,” she wrote. Her description of the Obama presidency and the fierce division between party lines, largely dividing northern and southern states, was shockingly accurate. Especially troubling is her prediction that Mr. Obama would be "the last one." Did she perceive him as our last elected president? Is something about to happen within the next year that will have this dramatic an effect on the United States? Vanga's prophetic view of the United States and world affairs in relation to the black president is not a negative thing, however. She appeared to see these events as leading into "a miracle and the whole world would win." She seemed to see the possibility of the world moving in one of two directions at this critical junction. Vanga saw a possibility that world tensions could escalate into a third world war and that "the nuclear bomb would be used again." The other route would involve a world leader who would grant the world a time of peace and prosperity. "But humanity must recognize and accept the guidance of this Messianic personality," she said. Her messages suggest that this new leader is involved in "a new religion that will take the earth by the storm." She calls this person a "peacemaker." In her words: "God is one and religions will soon find a common purpose and the whole humanity will come to believe one truth. Expect changes for the better, religions will unite, peace will be established on earth." She said people will then understand the existence of a spiritual world. In the negative version, Venga perceived some kind of nuclear disaster, possibly from a nuclear bomb, causing death and destruction of most life throughout the northern hemisphere. She saw this event occurring sometime between 2014 and 2015. She saw all of Europe isolated and people all over the world suffering from some kind of skin disease by about 2016. Note that the Fukishima disaster occurred in March, 2011 in Northern Japan. Radiation from the ongoing meltdown of three nuclear plants is still spewing from the site and experts still have not found a way to stop it. Radiation has been affecting life throughout the northern half of the world ever since. Experts warn that another major earthquake and/or tsunami like the one that destroyed the three nuclear plants at the Fukishima site could intensify this ongoing and unstoppable disaster, possibly making the northern hemisphere of the world too toxic for plants and animals to exist. Vanga saw the global ice caps melting the the sea levels rising, a new energy source would be developed "out of nothing" and there would be an amazing achievement in the field of medicine. New bodies would replace the worn out ones. Eventually humans will turn themselves into living robots. Remember that this woman died nearly 20 years ago and her prophecies were made before that. The things described here are only now beginning to be developed. She said that China would become a predominant world power and men will begin an exploration and settlements on the planets and moons in the solar system. Venga told of successful space exploration, with manned flights to Venus and Mars, and an actual settlement occurring on Mars. Sometime after 2170 the Martian colony would demand independence from Earth. Also an artificial sun would be created that would produce light on what is now the dark side of the Earth. Humanity also will establish a colony under the sea where there will be an abundance of food. During this time there will be a complete mixing of the races and one mixed race will predominate. But by 2200 the Sun will begin cooling and the world will become cold. Humans will begin a search for extraterrestrial life and in the process, "humanity comes into contact with what is something terrible. Spacecraft forgotten to Earth terrible new disease." Her other visions of the distant future: "Planets gradually changing planetary orbit. Mars is threatened by comets." She sees Earth scientists searching for a way to re-ignite the cooling sun which causes a powerful eruption of the sun. A consequence of this will be a change in the force of gravity. The old space stations and satellites will fall to Earth. Venga appears to have had a problem with time lines as she looked into future events. For instance, after predicting a nuclear disaster that destroyed all life in Europe, she perceived a time when an Islamic movement would take over the European nations. Eventually a French revolution would overpower the Islamic government. Yet before this, she suggests a collapse of the old religious belief systems. By about 4300 Venga said humans will have evolved to a point where they are using more of their brain cells. She said we will have evolved past the notion of hatred for one another and are beginning to understand God. "Man has finally reached such a level of development that can communicate with God. People achieve immortality." She said there will be a way to control all disease and organism behavior. By then we have assimilated with alien races. There will someday be about 340 billion humans living on the different planets.